Where do we begin? There are so many benefits to an account opening partnership with fiVISION we do not have enough space on this site to cover them all. 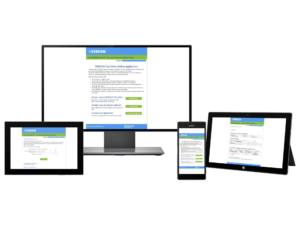 The best we can do is offer a small sampling….so below is a glimpse into why we are the best in providing a fast, enjoyable account opening experience for all users, across all devices. Our tight integration and branding make this the most effective way for you to increase your new account openings. Once you review this list of features see the benefits they can bring to your institution, please contact us to see our account opening in action. Check out our ever-expanding list of integration with other systems and services. From core processors to electronic signatures to decision support systems – find out more about how we pursue the most complete and fast, real-time integration with industry solutions to automate and speed up your account opening processes. Provide your customers a common Account Opening experience for retail or business accounts online, in-branch or over the phone. Applicants can move between channels, using our save and continue option – providing a solution meeting your customers’ needs. Our Management Console provides you have the same view and information no matter which channel your applicant selects. Call us to find out the average application completion rate. You will be amazed! We credit our high application completion rate with your ability to customize the customer experience and the ease with which the application process is completed. Costs for supporting and developing technology solutions for account opening products continue to climb. Using fiVISION ensures you maximize your investment in Account Opening and maintain up-to-date user interface and account opening technology at a reasonable and predictable cost. Best of all you do not pay for number of accounts, you only pay when an applicant has submitted their application – which is when you start to make money too! Ask our clients what they love about fiVISION and task automation is always on the top of the list. Automating tasks gives you the confidence that key items will be completed, always on time. 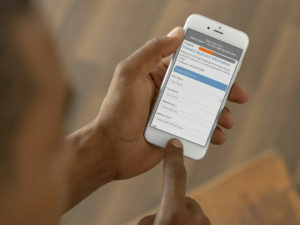 fiVISION’s Online Applications provide the ability for applicants to scan their Driver’s License information from their smartphone and automatically populate their application. This saves time and gives you the reputation of offering leading edge technology solutions to customers. And, did we mention the same scanning option is available for credit cards when funding an account. Account disclosures are integrated into the account opening experience. This provides you the confidence to know your applicants are well informed. Need to Adjust? You can update disclosures at any time using the Management Console. You have complete control over approval rule setup for each of your workflows and products. This puts the power of custom setup and configuration in your hands, allowing you to add or update rules at any time. To ensure the address entered by the Applicant is a deliverable mailing address, we check it for you. Integrations with FIS for IDV, QualiFile/ChexSystems and Red Flags, with Deluxe for Deluxe Detect, and LexisNexis for InstantID Q&A combined with fiVISION utilities like the Fraud Block list, OFAC Checks, IP/ACH/Address/Phone and Email Frequency checks help you mitigate risk. Let us know who your home or mobile banking vendor is and most likely we already have an integration. Along with fiVISION’s DNA, even if you have built your own, you can easily interface to our account opening application. We provide the ability to take loan applications and cross sell loan products right alongside your deposit accounts – complete with real-time integration with several popular LOS platforms. And, if you need us to add a LOS interface, let’s talk. Provide options to fund new accounts with credit/debit cards, ACH from another financial institution’s account and even real-time transfer from another account. We also have the ability to verify the ACH account of new applicants with an optional integration to Fiserv’s VerifyNow solution. You define the documents that are needed for each applicant and product type and our system automatically creates the notification to the applicant of what they need to provide. Documents can be uploaded in session, or after session via our Status Center. Documents that require signatures can be eSigned through our partners, enabling signing while in-session, via email, or in person. Applicants can start an online application and if they have a need to leave and desire to return, they have the option to save and return to the application at a later time. You can also schedule automated messages to those who save or abandon their applications inviting them to return and finish the application. Specific product offerings can be presented to applicants based on rules configured for different applicant and product combinations. Cross-selling is so smooth in our solution, it feels like a part of the application process and not an intrusion. Want to chat with your Applicants. No problem. We have interfaces to major chat service providers that can be easily added to your site. We can help. Our slick integration with ClickSWITCH for switchkit services eliminates many of the hurdles of new customers switching their direct deposit and recurring payments to your institution. and more…….contact us today for a personal tour of fiVISION Account Opening….